We think this is one of the best articles written by The Advertiser’s Michael McGuire 25 September, 2017 about the SANFL Grand Final. “IT was a victory for grit. 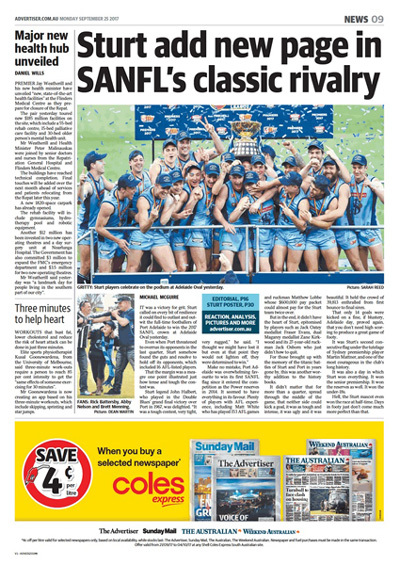 Sturt called on every bit of resilience it could find to outlast and outwit the full-time footballers of Port Adelaide to win the 2017 SANFL crown at Adelaide Oval yesterday. Even when Port threatened to overrun its opponents in the last quarter, Sturt somehow found the guts and resolve to hold off its opponents, which included 16 AFL-listed players. That the margin was a meager one point illustrated just how tense and tough the contest was. Make no mistake, Port Adelaide was overwhelming favourite to win its first SANFL flag since it entered the competition as the Power reserves in 2014. It seemed to have everything in its favour. Plenty of players with AFL experience, including Matt White who has played 153 AFL games and ruckman Matthew Lobbe whose $600,000 pay packet could almost pay for the Sturt team twice over. But in the end, it didn’t have the heart of Sturt, epitomized by players such as Jack Oatey medallist Fraser Evans, dual Magarey medallist Zane Kirkwood and its 27-year-old ruckman Jack Osborn who just didn’t know how to quit. For those brought up with the memory of the titanic battles of Sturt and Port in years gone by, this was another worthy addition to the history books. It didn’t matter that for more than a quarter, spread through the middle of the game, that neither side could kick a goal, it was tough and intense, it was ugly and it was beautiful. It held the crowd of 39,813 enthralled from first bounce to final siren. That only 14 goals were kicked on a fine, if blustery, Adelaide day, proved again, that you don’t need high scoring to produce a great game of footy. It was Sturt’s second consecutive flag under the tutelage of Sydney premiership player Martin Mattner, and one of the most courageous in the club’s long history. It was also a day in which Sturt won everything. It won the senior premiership. It won the reserves as well. It won the under-18s.